A compact hammer drill that uses battery power. A drill bit made for drilling into masonry and brick walls. Almost universally they have TCT inserts in the cutting tips. A rechargeable battery using Lithium Iron technology. A De Walt 18 volt cordless drill with Li-Ion batteries. 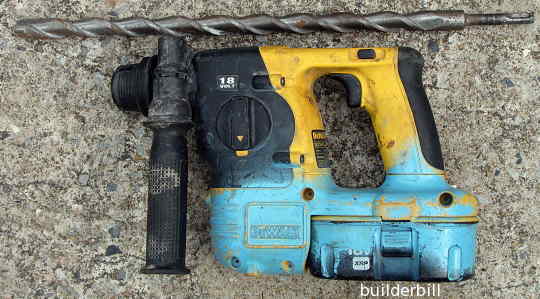 The cordless rotary hammer drill above is shown along with a 16mm TCT masonry drill bit capable of drilling about 300mm, 12" deep. I purposely put the bit alongside the compact drill, because the plumber that owns the tool regularly uses it for heavy work and he was enthusiastic about the capabilities of this small power tool.